Americas gateway to the universe. Leading the world in preparing and launching missions to Earth and beyond. 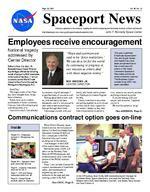 Sept. 28, 2001John F. Kennedy Space Center Spaceport Newshttp://www-pao.ksc.nasa.gov/kscpao/snews/snewstoc.htmVol. 40, No. 19 Pages 4-5  Spaceport News goes inside Mail Services. Page 8  Central Florida students watch for Starshine. Pages 2-3  Employees honored in Recognizing Our People.(See ADDRESS, Page 6)Page 7  CFC and Energy Awareness Month kick off. (See CSOC, Page 8) Employees receive encouragementNational tragedy addressed by Center DirectorEditors Note: On. Sept. 18, Kennedy Space Center Director Roy Bridges offered the following words of support to KSC employees in the wake of the Sept. 11 terrorist attacks on the World Trade Center in New York City and the Pentagon in Washington, D.C. This years planned Employee Appreciation Day and Super Safety and Health Day have been postponed due to the current security status of the Cape Canaveral Spaceport. New dates will be set when conditions improve. The Business Opportunities Expo 2001 has been cancelled.Communications contract option goes on-line InsideROY BRIDGES JR. CENTER DIRECTORGood Day! The tragic events of last Tuesday have changed many things here in America. Rarely have we as a nation confronted evil forces so directly. Like you, I am still coming to grips with the enormity of it. I am still in shock. I am affected by emotions of grief and anger. I expect that many of you are as well. Talking about these events with my wife and family has been therapeutic, and it is not unusual to seek some expert counseling to help get through these times. I encourage you talk with your family and friends and to contact our Employee Assistance Program for help. Clearly, Americans everywhere are pulling together to assist rescue workers and to show support for our nations leaders as they take time-critical actions to preserve lives, improve our security posture, and bring criminals to justice. If you are helping with your prayers and resources, I applaud you for it. We must be patient as we goHope and optimism are said to be force multipliers. We can do a lot for the world by continuing to progress in our mission as others deal with these negative events.When NASA-Kennedy Space Center exercises the first phase of Option 3 of the Consolidated Space Operations Contract (CSOC) on Oct. 1, employees in the KSC Industrial Area wont notice anything out of the ordinary. And managers in the CSOC office want to keep it that way. Behind the scenes, CSOC will take over the Kennedy Data Network (KDN) employees and communications tasks when that portion of the JBOSC contract expires. Phase 1 also includes Channel 60 support, maintenance of hand-held radios, and maintenance of engineering and system hardware on the page and area warning system in the KSCIn the CIF building, Brian Duffy, (left) associate program manager for Lockheed Martin Space Operations, discusses the Kennedy Data Network with CSOC team members, from left, Lisa Biddle, Kerry Stinson and Dom Calvoni Jr.Page 6  Customer Awareness event set for Oct. 2. SPACEPORT NEWS Sept. 28, 2001 Page 3 Dr. Irene Long selected for Hall of FameDr. Irene Long, Kennedy Space Center chief medical officer and associate director of the Spaceport Services directorate, was recently selected for induction into the Ohio Womens Hall of Fame. Long, a native of Cleveland, Ohio, is being recognized for her outstanding contributions to NASA and the field of aerospace medicine. I am very excited to be selected for the Ohio Womens Hall of Fame, said Long. Since the induction ceremony will be held in my hometown, where my dreams of a career with the space program began, it will be a special honor for me and my family. Established in 1978, the Ohio Womens Hall of Fame was created to recognize and honor the achievements of extraordinary Ohio women. Members include Vietnam veterans memorial designer Maya Lin and space shuttle astronaut Judith Resnick. Throughout her career, Long has been committed to the improvement of the well-being of the workforce. She played a key role in the development of the KSC Fitness Center and KSC Rehab Works Facility. Her promotion of healthy lifestyles has provided employees with the information andDr. Irene Longtools necessary to improve their lives and overall health. Long began her NASA career in 1982 at KSC after completing her aerospace medicine residency at the Ames Research Center. She is responsible for the coordination and integration of the Centers occupational health, institutional safety, and environmental programs. Prior to her current position, she served as director of the Biomedical office and chief of the medical and environmental health office. Long is very active in the Centers educational outreach programs and is one of the founders of the Space Life Sciences Training Program (SLSTP), a program designed to increase the number of women and underrepresented minorities in science related fields. The 2001 Ohio Womens Hall of Fame inductions will be held Oct. 17 in Cleveland. Crew trainer Buck Tomlinson retiresI am very excited to be selected for the Ohio Womens Hall of Fame. Since the induction ceremony will be held in my hometown, where my dreams of a career with the space program began, it will be a special honor for me and my family.DR. IRENE LONG CHIEF MEDICAL OFFICERThe year 2001 marks the beginning of a new millennium for Kennedy Space Center, and the end of a career for one of NASAs most dedicated employees, Buck Tomlinson. Tomlinson worked at KSC over a span of 35 years under many different organizations and positions, and has been a living part of the history of the Center. In 1969, Tomlinson was hired to work as a firefighter at the Cape, a position at which he proved himself to be an asset to the agency. It wasnt long before Tomlinson was helping to train the Apollo astronauts in the emergency egress techniques necessary to help save their lives in case of a malfunction. Tomlinson left KSC in 1972 to pursue work in another field of civil service, but it wasnt long before he returned to the Center. In 1979 he became communication supervisor under subcontractor Wackenhut, and over the next 21 years, he helped to train the Shuttle astronauts in fire and emergency egress procedures. Tomlinson has worked with the Space Shuttle program over 100 missions, and describes his tenure at KSC as absolutely the best years of his life. He has had quite a few interesting experiences during his career at Kennedy Space Center. During training sessions, the flight crew would have problems with sand spurs getting stuck to their flight suits. I knew that if you wet your fingers before you picked them off, they wouldnt stick to you, recalls Tomlinson. Unfortunately, one confused astronaut ended up with a sand spur stuck in his mouth. Tomlinson has seen almost everything while working at the Cape. In 1987 he was nominated by the Shuttle flight crew for the Silver Snoopy award, which was presented to him by astronaut Bill Shepherd. At his retirement, Tomlinson was given a montage signed by the astronauts, in gratitude for his years of devoted service. Hes one of the best people Ive worked with, and hes a true friend of Kennedy Space Center, said Launch Director Mike Leinbauch. It is a feeling shared by many of those who have worked with him over the years.Launch Director Mike Leinbauch recognizes Buck Tomlinsons years of service. Inside SPACEPORT NEWSPage 4 Sept. 28, 2001Mail Services handles millions of letters and packages each year at the Cape Canaveral Spaceport as part of the Joint Base Operations and Support Contract. More than 900,000 mail items are received and delivered each month by Mail Services and are processed through the Central Mail Facility in the KSC Headquarters Building and seven submail facilities. Sub-mail facilities are located throughout the Spaceport and are designed to receive andEnoch Allen (left) and James Paul sort mail in the Operations Support Building sub-mail facility. Darrell Wilson demonstrates the screening of a suspect package. Mike Oliver (left) and Bob b Rick Wade sorts mail in the Central Mail Facility. Bill White (left) and Dennis Young process mail. Ruben Mack (left) and Richard Klos help customers in the KSC Post Office.distribute a large volume of mail and to provide a multitude of services. Mail Services employees drive more than 16,000 miles a month to service 31,500 mail stops at the Kennedy Space Center, Cape Canaveral Air Force Station, Patrick Air Force Base and two Florida missile tracking annexes. Mail delivery and related services offered by Mail Services are provided by a dedicated team of 33 employees, most of whom have worked at the Spaceport for 30 years or more. We have employees who do an outsta n job of determining the destination of mail it regardless of how they are addressed, sai d Nelson, senior supervisor of Mail Services That comes from years of experience distr i ing mail. Years of experience is also important wh e employees must be able to detect suspicio u packages that may be in the mail system. Suspect packages are ultimately dealt with the security force bomb experts. Page 5SPA CEPORT NEWS Sept. 28, 2001 Mail Services Mail delivery and related services offered by Mail Services are provided by a dedicated team of 33 employees. b y Strisko prepare an issue of the Spaceport News for distribution. Mail Services receives and delivers more than 900,000 mail items each month. Kathy Newland updates the KSC Locator database. n ding ems d Al i bute re u s by Mail Services employees work for InDyne, Inc., a team member of Space Gateway Support, the JBOSC Contractor. Among its many functions, Mail Serviceoperates the KSC Post Office and the KSC Locator System,prepares the KSC Telephone Directory,provides daily distribution and delivery of launch-related and administrative documents,supports the NASA Procurement Office,provides direct courier support for launches,provides for the processing of mail items for and from Ascension and Antigua Islands,provides special cancellation service for special events,pickup and delivery of controlled mail, andmaintains official bulletin boards, directory boards, and KSC Countdown newsletter boards. SPACEPORT NEWS Sept. 28, 2001ADDRESS ...(Continued from Page 1)Page 6Kennedy Space Center employees displayed their patriotism and solidarity on Sept. 14 by wearing the flag. The day was observed nationally as a memorial to all those who perished in the Sept. 11 terrorist attacks. Pictured are Lori Frank, left, and Bob Granger, both United Space Alliance employees, talking with their coworkers in the cafeteria. Show of supportCustomer Service Week event set for Oct. 2forward. As a people of action, that is hard to do, but the types of forces we are dealing with require our utmost in patience and persistence to produce results that fit into our sense of justice and freedom. There will be many more inconveniences for all of us in the coming days. For example, I have had to change my schedule to get through the gate in a reasonable time. Air travel will be more tedious and time consuming. We will probably have less tours to our critical operations areas. We will have to cancel some special events. Over time, we will become more efficient while still maintaining security. Again, I urge patience and personal adjustments to help out wherever you can. We have all been through difficult times before. I am convinced that we will get through these times successfully and victoriously with your help. Here at KSC, lets all renew our focus on safety, health, and security as we go about our daily activities. People are counting on us to perform our mission well. Among those are three members of the Expedition III crew on orbit. Also, we have important ELV missions in Alaska and California this week. It was hard to get our teams to the launch sites, but we did it, and were ready to go forward. I could go on, but I hope you get the point. The best way for us to help the country during these trying times is to refocus and redouble our efforts to do our jobs very, very well. The essence of our mission to explore and develop space represents much of what is good and noble for our civilization. America and our partners around the world are counting on us to sustain hope for a bright future for humankind. Hope and optimism are said to be force multipliers. We can do a lot for the world by continuing to progress in our mission as others deal with these negative events. We have a great team here at KSC. I know that I can count on you to remain extremely vigilant regarding our security and help the team accomplish our mission in our traditional superb and safe manner. Thank you. National Customer Service Week begins Oct. 1, and Kennedy Space Center plans a kickoff Oct 2. The kickoff will begin at 9 a.m. in the Training Auditorium. This years theme combines key elements of the National Customer Service Week: people, service and celebrate the customer. The kickoff speaker will be Larry Sutton, North American Sales Manager for Corning Inc. Corning Telecommunications Products Division was the 1995 winner of the Malcolm Baldrige Quality Award. Emphasis on customer service began in 1993 at KSC after an executive order called for a revolution within the Federal Government to change the way it does business. The following mandates were given: Identify customers who are, or should be, served by the agency; Survey customers to determine the kind and quality of services they want and their level of satisfaction with existing services; Post service standards and measure results against them; Benchmark customer service standards against the best in business; Survey front-line employees to identify barriers and obtain ideas for matching the best in business; Provide customers with choices in both the sources of service and means of delivery; Make information, services, and complaint systems easily accessible; and Provide means to address customer complaints. The executive order called for putting customers first and striving for a customer-driven government that matches or exceeds the best service available in the private sector. The directive also called for all agencies to develop customer service standards guarantees. KSC current external customer satisfaction measurements can be accessed in Business World under KSC Strategic Planning and Projects. The KSC Contact Center, which is available from the KSC Home Page under Contact Us, also provides information. Please direct additional questions to Michele Foster at 867-9278. SPACEPORT NEWS Sept. 28, 2001 Page 7 Combined Federal Campaign to kick offWorking group helps build energy awarenessThis years KSC Combined Federal Campaign will officially get underway with a kickoff rally on Oct. 1 at 9 a.m. in the Training Auditorium. All NASA employees are invited to the kickoff rally to learn more about the Combined Federal Campaign and where their contributions will go. Guest speakers will include Jim Ross of Crosswinds Youth Services; John Lammi of The Family Counseling Center; and Joe Robinson of North Brevard Charities. Training for unit coordinators and key solicitors will be conducted immediately following the kickoff program. The campaign will run through Oct. 31. The theme for this year is, United We Care! The CFC is a perfect opportunity to get personally involved and show that unity. Further information about the Campaign can be found on the KSC CFC Web site at http:// cfc.ksc.nasa.gov. This Web site, which will become fully active on Oct. 1, will include a brochure and online contribution form that employees will use to make their contribution. Among other choices, the brochure lists many local and national agencies involved in disaster response and relief efforts. All Combined Federal Campaign contributors will be eligible to win a prize in a weekly drawing to be held during each of the four weeks of the campaign, as well as being entered for the grand prize drawing to be held at the conclusion of the campaign. The prizes are as follows: Week One: $25 gift certificate to the NASA Exchange; Week Two: Four Maximum Access tickets to the KSC Visitor Complex; Week Three: $50 gift certificate to the NASA Exchange; Week Four: Four Maximum Access tickets to the KSC Visitor Complex; Grand Prize: All NASA employees are invited to the kickoff rally to learn more about the Combined Federal Campaign and where their contributions will go.Center Director Roy Bridges previews the Combined Federal Campaign Web site with Laurie Brown, (left) NASA CFC web coordinator, and Sayre Stephens, web developer.A $100 gift certificate to the NASA Exchange, plus two passes on the Center Directors Bus for a future Shuttle launch. The earlier in the campaign an employee makes his or her contribution, the more chances they will have to win. Be Energy Smart is this years theme for the October National Energy Awareness Month. The theme was chosen to stress the importance of conserving energy and making intelligent, clean energy choices at home, at work, at school and on the move. Kennedy Space Center continues to make progress in complying with Federal energy efficiency mandates and energy cost reduction goals. The Energy Working Group, formed at the Kennedy Space Center 10 years ago, continues to help lead the way. The group provides a forum todevelop policies and plans,report progress and accomplishments,increase awareness,advocate and pursue initiatives and technology applications,forecast consumption and cost,and foster consistency across the Cape Canaveral Spaceport. Members come from organizations that can take action to improve energy efficiency in NASA facilities and processes at KSC, Cape Canaveral Air Force Station, and Patrick Air Force Base. The Group is chaired by NASA Energy Manager Wayne Thalasinos. While most of our group doesnt focus directly on space flight, we feel our effort in reducing KSCs Energy Consumption and its associated cost, which is expected to top $16 million this year, is important to our budget as well as our environment, said Thalasinos. The group just completed a fiveyear energy plan with goals for energy use; facility greenhouse gas emissions; renewable energy; petroleum reduction; audits; projects; and life-cycle cost analysis, sustainable design, and efficient products. Building the plan is valuable because it attracts attention to facility energy requirements and focuses the efforts of multiple KSC organizations on three major themes: emergency conservation, on-going conservation, and cost reduction. The group just completed a twoday energy and water management functional review in August. Team members briefed NASA Headquarters with positive feedback to KSC from the headquarters review team. A draft report will be received in late September with a final report to the Center Director. During October, energy tips will appear in the KSC Daily News and Countdown Employees are encouraged to become more energy efficient, report waste via trouble calls and submit opportunities for improvements to the energy group. Page 8SPACEPORT NEWS Sept. 28, 2001 John F. Kennedy Space Center Managing editor. . . . . . . . . . . . . . . . . . . Bruce Buckingham Editor. . . . . . . . . . . . . . . . . . . . . . . . . . Kathy Hagood Editorial support provided by InDyne Inc. Writers Group. NASA at KSC is located on the Internet at http://www.ksc.nasa.gov USGPO: 633-096/00066Spaceport News Spaceport News is an official publication of the Kennedy Space Center and is published on alternate Fridays by External Relations and Business Development in the interest of KSC civil service and contractor employees. Contributions are welcome and should be submitted two weeks before publication to the Media Services Branch, XAE-1. E-mail submissions can be sent to Katharine.Hagood-1@ksc.nasa.govCSOC ...(Continued from Page 1)Industrial Area. The transition of these tasks from JBOSC to CSOC should be invisible to the end user, said Brian Duffy, vice president and associate program manager for KSCs CSOC operations. For example, explained Tom Bond, deputy associate program manager, when an employee experiences a computer problem, the employee calls the normal help desk, and the help desk will route the call to the CSOC networks operation center if it is determined to be a network problem. So, as far as the employee is concerned, nothing has changed, and he or she will receive the same service as always. CSOC was created when NASA recognized an opportunity for cost savings by collecting all the communications functions and consolidating them within a single Agency-wide contract vehicle. Companies competed for the contract through normal procurement procedures, and Lockheed Martin led the team that was finally selected. The CSOC contract started agency-wide on Jan. 1, 1999. Although some CSOC elements have been operating at KSC since that time, Option 3 is the first major CSOC undertaking at KSC. Since the contract went into effect agencywide, CSOC has had a small presence at KSC. Some of the projects have included management of the Wide Area Network (WAN), which connects the NASA Centers, and NASA Integrated Services Network (NISN), which includes the Video Teleconference System (ViTS), Voice Teleconference System (VoTS), office polycoms, and fax machines, to name a few examples. On Oct. 1, 1999, the Lockheed Martin Space Operations portion of the KSC NASA Checkout and Launch Control System (CLCS) project was added to the CSOC contract. Awarded by NASA to Lockheed Martin in October 1998, CSOC manages NASAs command and control, data collection, telemetry and communications operations that support Earth-orbiting satellites, planetary exploration and human spaceflight activities. The CSOC provides various services to several NASA Centers in addition to Kennedy Space Center, including Goddard Space Flight Center, the Jet Propulsion Laboratory, Johnson Space Center and Marshall Space Flight Center. Brian Duffy heads CSOC at KSCLeading CSOC at KSC is Brian Duffy, vice president and associate program manager for Lockheed Martin Space Operations. Duffy joined Lockheed Martin in May 2001 after spending 16 years with NASA as an astronaut and in senior leadership positions. He served as commander of STS92 and STS-72, and served as pilot of STS-45 and STS-57. During his tenure at the Johnson Space Center (JSC), he served in several management positions including the JSC deputy director (acting) and assistant director (technical). Before joining NASA, Duffy served as a test pilot and was the Director of F-15 flight tests at Eglin AFB in Florida. During his career, Duffy logged more than 5,000 flight hours in more than 25 different aircraft. He retired in July 2001 after 26 years with the Air Force. He has received many awards, including the NASA Distinguished Service Medal, the NASA Outstanding Leadership Medal and the Distinguished Flying Cross.Central Florida students follow Starshine launchAt press time Central Florida students were eagerly awaiting the launch of the Starshine 3 spacecraft. Starshine was set to launch aboard an Athena I rocket from Kodiak Island, Alaska, no earlier than Sept 27 at 9:30 p.m. EDT. Central Florida students helped build the NASA-sponsored satellite by polishing some of its 1,500 aluminum mirrors. Its one-inch mirrors were machined by technology students in Utah, with the grinding and polishing of the mirrors being accomplished by students in kindergarten through twelfth grade in schools all over the world. The Starshine 3 spacecraft is a hollow aluminum sphere almost a meter in diameter (37 inches) and weighing 90 kilograms (197 pounds). It consists of 31 retro-reflectors and seven clusters of solar cells powering an amateur radio transmitter, as well as the 1,500 student-polished mirrors. Participating students will visually track Starshine 3 and log their findings.Central Florida students helped build the Starshine spacecraft, which is pictured during processing.